S. Craig Zahler’s horror-Western hybrid Bone Tomahawk is a strange movie, one that might take more than one watch to fully understand. Not that it’s deliberately obscure, or has a plot too complicated to follow the first time around. It’s actually a pretty straightforward film, albeit one filled with eccentric choices: quirky Tarantino-esque monologues delivered in formal period speech; slow, rambling scenes punctuated with extreme gore; antagonists that could be read as racist caricatures, except the movie bends over backward to assure you they’re not; and, to cap it all off, an operatic theme song that lays out the plot, Gilligan’s Island-style. It’s that last bit that might contain the key. 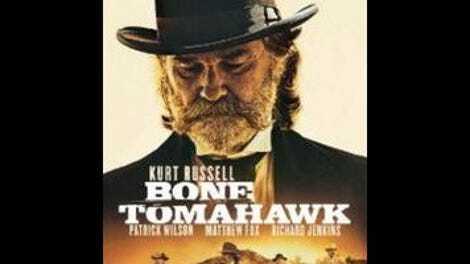 Spaghetti Westerns often feature similarly descriptive themes—from the iconic (Luis Bacalov’s Django theme) to the bizarre (Sybil & Guy’s “Keoma”)—and viewed through the lens of Italian exploitation films, Bone Tomahawk starts to make sense. The horror elements more specifically draw from the much-derided cannibal subgenre, depicting a primitive race of inbred, mud-caked “Troglodytes” who communicate through eerie howling, slaughter every living thing they meet, and, as is explained in an early exposition scene, are not representative of Native Americans as a whole. (Zahler takes a revisionist approach to some of the Old West’s more unenlightened aspects, and our heroes are some of the least bigoted settlers this side of the Rio Grande.) Also like a cannibal movie, Bone Tomahawk features a handful of sickeningly realistic gore scenes that prove that, although the Troglodytes have yet to develop a spoken language, they’re pretty inventive butchers. That all doesn’t start until after the 90-minute mark, however. For most of its 132-minute running time, Bone Tomahawk is a talky, character-driven Western with more in common with John Ford than Enzo Castellari. The main plot of the film explicitly nods to Ford’s 1956 film The Searchers, with fair-minded, paternal small-town sheriff Franklin Hunt (Kurt Russell) leading a team of Western archetypes. There’s the well-meaning but inept “backup deputy,” Chicory (Richard Jenkins); Arthur O’Dwyer (Patrick Wilson), a happily married cowboy sidelined by a leg injury; and handsome-but-amoral gunslinger John Brooder (Matthew Fox), all of whom join Hunt on a mission to rescue O’Dwyer’s wife and another deputy after they go missing from the jailhouse one night. This all happens because of a drifter, Purvis (David Arquette), who Chicory spies burying some suspicious items and, as it turns out, recently desecrated a Troglodyte burial ground. 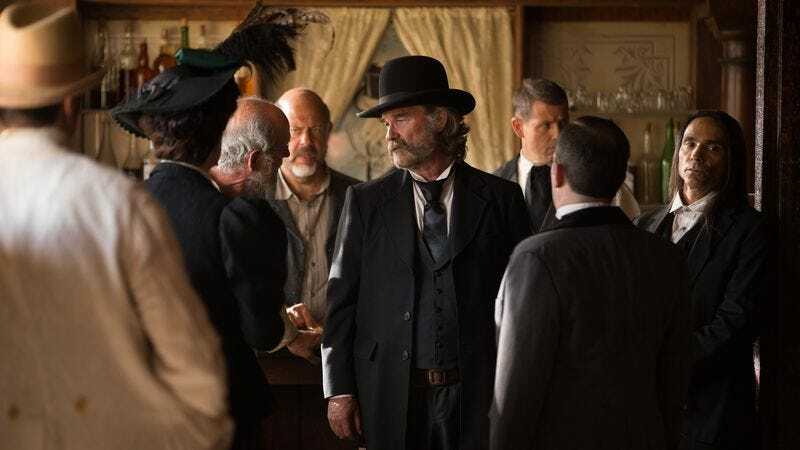 Bone Tomahawk boasts a capable, experienced cast, without whom the already-slow pace of the film would feel interminable. Zahler takes his time with almost every scene, letting a sequence of O’Dwyer changing the dressing on his injured leg, for example, play out in its painful entirety. His script is another of the film’s strange hybrids, combining period-accurate formality with a modern penchant for non-sequitur; Jenkins in particular seems to enjoy tearing into the juicier dialogue, waxing eloquent about flea circuses and reading in the bathtub even in moments of mortal danger. His warm relationship with Russell’s Hunt brings depth to both of their characters, something that Fox’s one-note wild card Brooder and Wilson’s one-note good guy O’Dwyer both could have used. Despite its fantastic elements, Bone Tomahawk is obsessed with realism, in its settings, its dialogue, its violence, and its performances. Sometimes this is an asset, and sometimes—like in the surprisingly flat cinematography—it’s a detriment. Why emulate the pacing of old Westerns, but not their epic scope? Just another odd facet to a movie that’s full of them.